The problem seemed to be confined to the left channel, so while my brother was visiting this weekend, we made a concerted effort to track the problem down. At first, we thought that swapping the speaker cables over transferred the problem to the right speaker, but with more experimentation, we worked out that it must be the amplifier itself. Opening up the case of the amp revealed the problem all too clearly, as you can see from the picture above. Usually, it's nearly impossible to find faults in circuit boards just by looking at them, but the strong smell of burning and wide distribution of thick black soot was easy to spot, even for a non-expert. 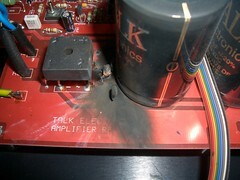 It seems that one or more capacitors have blown in a rather terminal way. My poor amp. Talk doesn't make this model any more, but I'm going to send them an email and some photos anyway to see if there's any chance a repair would be a) possible and b) economically feasible. If not, I'm having to shop for a new or second-hand amplifier. If any hi-fi enthusiasts out there can recommend a decent quality integrated amp for about the £200-300 mark (preferably with a phono stage), I'm open to suggestions!